The Rivanna IDPA club put on it's "Weapons Master" match this weekend. 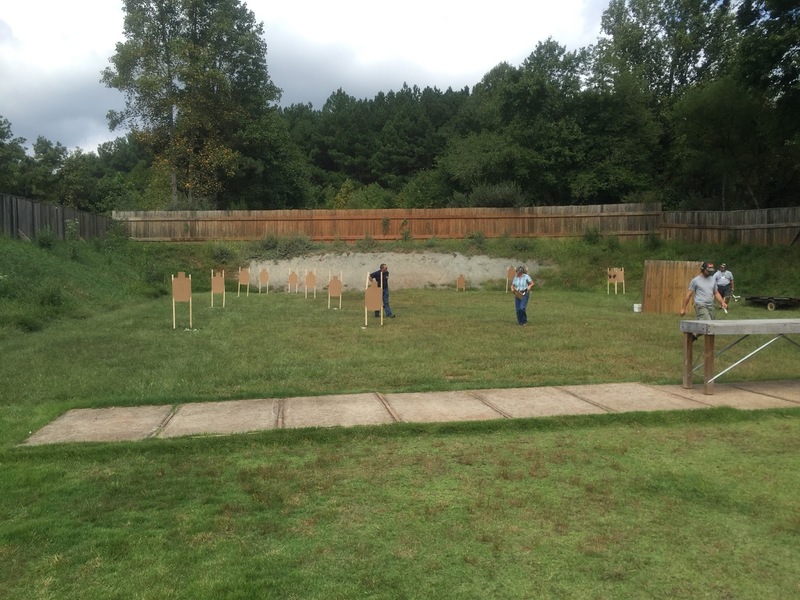 In additional to the usual IDPA match, there were two stages each for shotgun and rifle. The rifle and shotgun stages were optional, and shooters could shoot either or both. Even though I have shot neither the rifle nor the shotgun competitively, I signed up and was looking forward to the fun. I opted to start with the shotgun stages. The courses of fire required shooting birdshot, buckshot and slugs, both while standing and on the move. The ammo types were mixed throughout the stages, and only three rounds max could be loaded in the gun at any time. Keeping the ammo straight was to be the most challenging, and frustrating, part of shooting the stages. The first stage started with a single round of buckshot in the gun. After engaging a paper target, three rounds of birdshot were loaded and three clay targets were shot on the move. Arriving at the next position there were two falling steel targets, one requiring buckshot, the second a slug. Next, three more clays engaged on the move with birdshot. The final position had a paper target requiring two buckshot rounds. The second shotgun stage was of similar setup. One of the positions had a steel target that activated a drop turner. This is where that stage went wrong for me. With two rounds of buckshot in the gun, I hit the steel and turned to the drop turner — which wasn't moving. Thinking I missed the steel, I lowered the gun to load another round of buck. As I did, the steel completed its fall and the drop turner dropped. So not only I had a missed target, there's was a round of buckshot to eject before I shot the next targets. Any plan I had was gone from that point on! I was happy with my shooting, though my reloading could be timed with a sundial! I have no "muscle memory" built up with the shotgun. As fate would have it, I was also the first shooter on the squad for these stages, so did not have the benefit after watching anyone else first. Never having shot a tactical shotgun match before, I was not expecting to be jumping between ammo types throughout the stage. I had different ammo staged in a side saddle on the gun, in a vest pocket, and in a pants pocket. I'm not a fan of "memory stages" in general but still enjoyed the shooting aspect of the stages. After the fact, I thought of a number of things I should done differently, especially with regard to how I carried the ammo and reloaded the gun. Despite the slow runs, and the missed target issue, the stages were a blast. I learned a lot and am looking forward to getting to the range for more work with the shotgun. Next up were the two rifle stages. The first stage consisted of eight targets at increasing distances, four on each side. The targets were to be shot near to far down the left side, then far to near on the right, with three hits each. The rifle started unloaded on a table along with a magazine loaded with twelve rounds. At the start, we got up from a chair, loaded the gun and engaged the left targets from low cover. Moving to the second position where a second mag was located, the remaining targets were engage from a kneeling or seated position. 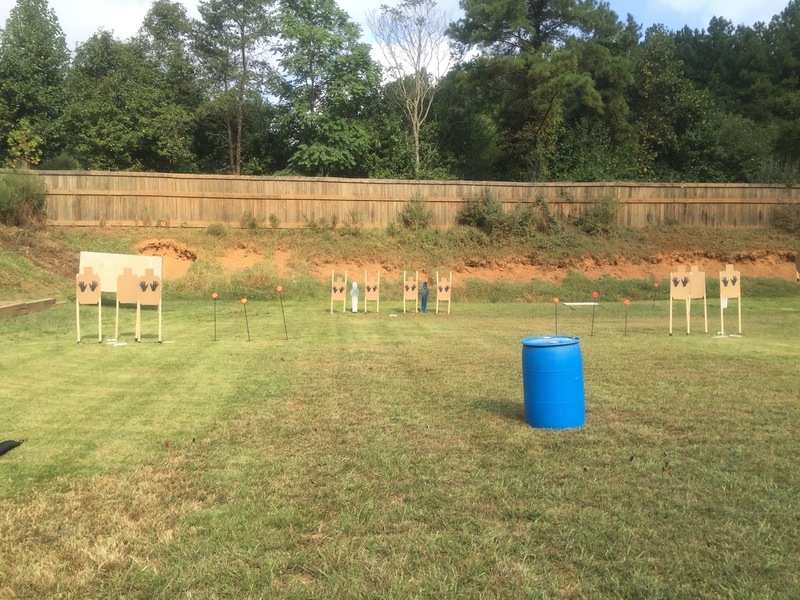 The second rifle stage was pretty much a typical IDPA stage, but shot with a rifle. Targets were engaged from cover and from multiple positions. Each target required two body shots and a head shot. 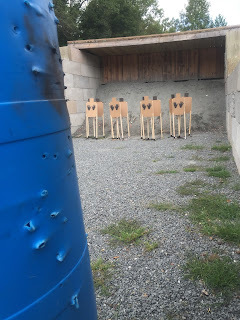 As opposed to the distance shots on the first stage, the targets were moderately close, necessitating changes on aiming, especially on the head shots. While I didn't win any races, I shot better on the rifle stages than I actually expected. It was great to get in some "real world" shooting rather than simply shooting while standing still at the range. After those fun long gun stages, it was time to return to more familiar territory and shoot the three pistol stages. The first stage was shot from a seated position, with the unloaded gun in a box and all magazines on a table. Six targets, partially hidden by non-threats required three hits each. The next stage started with engaging three targets while backing up. Then we moved to a prone position to shoot through a ground-level opening. Behind the opening were five more paper targets, and two steel plates. The steel targets were placed directly in front of non-threat targets. I cleared the steel successfully despite the challenging shooting position. The last stage was a quick course of fire set up in the plinking range. There were eight paper targets, arranged in pairs. They were set at an angle to each other, with a non-threat in the front. The targets were engaged from the outside of two barrels set on either side of the bay. Only four of the targets were visible from either side. This was a fast and fun stage to shoot. This was an extremely enjoyable and well run match. We shot seven stages total, and I was on the road home by 1:15PM. I was pleased with my scores in the pistol match. I learned some things on both the rifle and shotgun courses, and am especially looking forward to getting out with the shotgun more. I had forgotten how much fun it is to shoot, especially when not shooting an extremely high number of rounds in one day. Now I have three weapons to clean, and a lot of ammo boxes to sort out. But that's not an awful problem to have.